Robert Arthur Cambridge had been to the National Gallery in London with his sawed-off shotgun once before. Not just there but the Tate Gallery, too. Both of those times he’d wandered around, looking at art, the gun hidden in a small flight bag he carried by its handles. On those days he’d kept his disquiet mind in check and had left the paintings untouched and had gone home — taking the Underground south to Wimbledon and his mother’s flat where he’d been living since his divorce four years before. At 37, Cambridge’s life was a failure. He was unemployed, living in an apartment filled with ugly childhood memories: ceaseless battles between his domineering mother and a father he remembered as drunk and weak; cruel schoolmates; a fractured family life. He joined the army at 17 and left a year later, the same directionless, anti-social boy he’d always been. One clerical job followed another until the day he got drunk, smashed a window and was escorted from a job by police. The marriage should have stabilized him, he thought. She left after he tried to commit suicide, twice, and wouldn’t get psychiatric help. Now he was a drunk with a bad back who sometimes sold antiques in a street market, his dreams of an ideal family — peaceful and self-affirming — as empty as his future. And then, quite by accident, he found the family he’d been looking for. For three months, Cambridge had been wandering aimlessly through the city, getting on and off the Tube at random stops. 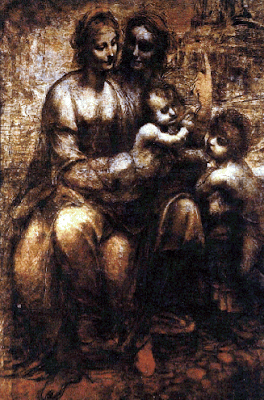 One day he walked into Room 7 in the National Gallery and found himself face to face with Leonardo da Vinci’s tranquil, reverential cartoon known as the Virgin and Child with Saint Anne and Saint John the Baptist. The four-foot, 6-inch tall charcoal sketch sits by itself, the only piece of artwork in the small room. The lights are dim; people speak in whispers. The face of Mary radiates serenity. Cambridge found himself seated in a chair, staring at the iconic, beatific mothers and their two boys, deeply moved by their beauty. A week later, July 17, 1987, Cambridge arrives back the National Gallery. His plan is simple: wait until just before closing when the museum is beginning to empty, wait for a guard to give him the final warning to leave, wait for that guard to walk away, and then pull out the shotgun. It’s late afternoon as he pushes through the front revolving doors of the museum. He wanders from room to room, a feeling of pressure building inside his head. He has a cup of tea in the cafeteria. The clock inches closer to 6 p.m: closing time. He walks up the stairs from the cafeteria to the main floor. More wandering; more art-filled walls. Raphael. Michelangelo. da Vinci. Titian. Finally, Room 7. He sits on a bench. Slowly, the room clears. 5:55 p.m. Right on schedule, here’s the guard with the final warning. The guard turns and leaves. Cambridge stands. And in the space of a few seconds, he takes the gun from the bag, holds it waist high and blasts, without aiming, a six-inch-wide crater in the glass over the Virgin Mary’s heart. Cambridge spent four years in a maximum-security mental hospital undergoing intensive psychotherapy. The Independent in London profiled him the month before he got out and described a hyperactive man who spouted self-help platitudes — he repeatedly called it “a cry for help” — when asked why he’d attacked the painting. The story never mentions if his mother came to visit.